Male is unmistakable, with reddish brown mantle and wings coverts contrasting to the grey top of head and rump, black facial mask and black tail with white sides to base. Females are warm brown above, tail darker brown, whitish underparts with dense crescent barring on breast and flank. Compare to similar Daurian Shrike. Juvenile has crescent markings on upperparts and variable dark subterminal markings to tertials. 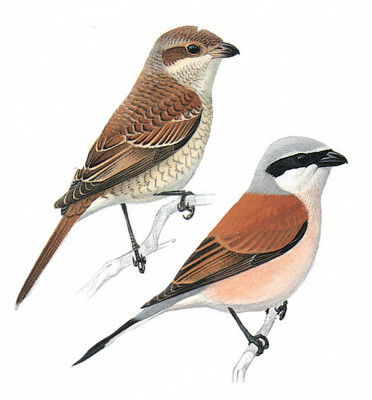 Compare to juvenile Woodchat Shrike. Typical shrike behaviour, perched exposed, diving to ground for prey and returning.